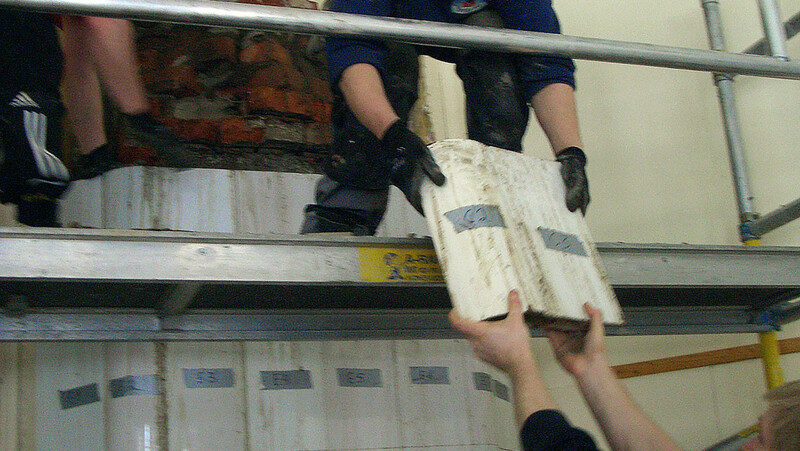 Pictures of restoration work during the intensive course Sustainable Heritage—Tiled Stoves in an Old School Building in Ekenäs, Finland, attended by Swedish, Estonian and Finnish students. In the first part of this intensive course in April 2011, a group of students from Novia UAS, the host school, dismantled three tiled stoves that were not in working order. Two of these will have been built up later in autumn 2011. They stand in an old classroom of a 19th century school building which had no other heating than two stoves per classroom until 1962. Fifteen stoves remain from those times—thirteen of which are out of order because the smoke channels are worn out and partly blocked. Hands–on work part 1 in April 2011: the picture series shows the dismantling of stove 1 which will be replaced by a better one from another minor room; the re–building of two stoves is presented in slide show ‘Hands–on work in September 2011’. cleaning the tiles from mortar and bricks; packing in the stove for future use.